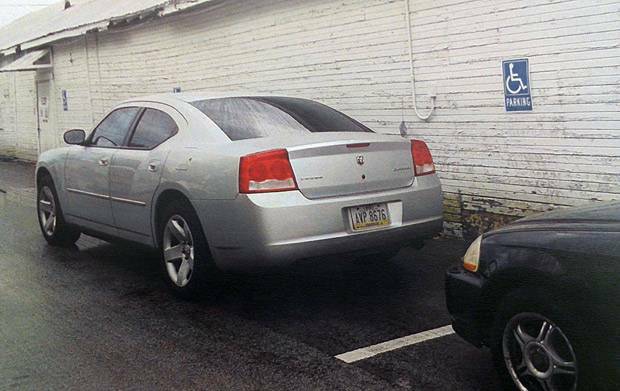 The Dispatch published an article Wednesday about the Franklin County Sheriff’s recent decision to park his car in a handicapped-only parking space. Sheriff Zachary Scott was campaigning at the Franklin County Fair’s Junior Baking Auction, and he must have been in a hurry to bid on a batch of fresh-baked cupcakes because he left his car in a clearly marked handicapped-only spot. Sheriff Scott says he made an “honest mistake.” He complains that the pavement wasn’t marked, and I guess the bright blue reflective signs posted at eye level all along the row must have escaped his attention as well. Looking at this picture of the same lot, empty, it’s obvious to anyone with functioning eyes that the entire row is reserved for the disabled. Maybe Sheriff Scott needs glasses, or would that ruin his carefully-constructed TV-cop image? I guess he should have bought some carrot cake at the bake sale, I hear the carrots are good for your eyesight. More likely he’s using the same excuse millions of drivers have used over the years to try to avoid getting a ticket. I wonder, would Sheriff Scott let someone go unpunished if they claimed they didn’t see the speed limit sign, or the fire hydrant, or the handicapped parking only sign? The Sheriff is not above the law, not even the little laws like leaving reserved spaces open for those who truly need them.